New women golfers have now been officially bitten by the bug after Foxhills Club & Resort opened its doors to host an introductory women’s golf day. The historic Surrey resort welcomed more than 30 women – ranging from teenagers to women in their 60s – to learn the basic technique of the swing and take their first steps in the sport. While some had limited experience of golf, most had never even swung a club before. But the event has proved a huge success with several of the participants already signed up for more coaching sessions and some keen to join up with a membership at one of Surrey’s leading golf resorts. 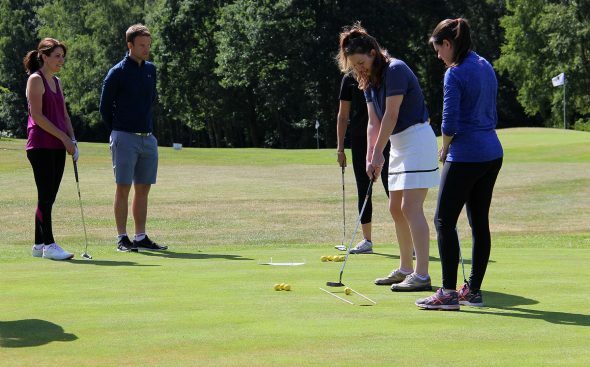 Foxhills assistant professional, Lauren Blease, said: “It’s fantastic to see women genuinely engaged in golf, especially as many of them had never really thought about playing before. “Most of the women had never played at all, while some had had a little experience a few years ago but never really taken up the sport properly. As part of the experience, there was a one-hour Pilates for Golf session hosted by Linda Segerstam of The Intelligent Core, which underlined the health benefits to improve core stability and flexibility, while the women also indulged in Foxhills’ award-wining spa facilities. After the success, Foxhills is already planning a second women’s golf day later in the year but for those who can’t wait to get involved, spaces are available to join women-only group coaching sessions for beginners. To book a place, contact the golf team on 01932 704465 or email lblease@foxhills.co.uk.